takilya ni leaflens - dakilang #filmmiron ever! | leaflens' fearless film reviews; read at your own risk – siyang tunay. ayaw mo maniwala? chenes ka! I still don’t like the horror film genre in general, but from time to time, I revisit it when something notable comes out, notable due to the unique concept or interesting storytelling. But this one I was forced to see because I wanted to see what merit it had for being included in this batch, and why it won a handful of awards. Pitch: A priest investigator researches about a kid supposedly performing holy miracles amidst the backdrop of a bunch of would-be priests undergoing a seclusion ritual prior to being ordained chenelyn. Catch: Horror na horror (in a good way) ang pagkakagawa, pero horror (in a bad way) ang ending pagkanood. That this film won best cinematography and best production design is understandable. I like the period film look as they simulate the air of the 1940s. The costumes didn’t seem to come from one single costume designer’s baul, the props looked authentic for their era, and I loved that car, man. Questioning the sunglasses of the investigating priest from time to time as I wonder if a priestly character who took a vow of poverty would wear something as stylish as aviator glasses back then. But I nitpick. I like that the film follows the textbook Horror Genre Filmmaking 101 conventions in terms of putting elements together: you have the tadaaaaah! scary music that accompanies the halaaaa! shot of swish panning to reveal something or having a creature or prop pop out of nowhere to scare the bejeezus outta ya, with the winning sound design helping to add palaman to this very obviously made horror sandwich. You certainly know how to scare people, man. Now here’s the scary part: The acting of the would-be priests didn’t convince me beyond their cardboard characters’ capacity, not enough to feel sorry for them when their own personal horrors started to appear to taunt them during their seclusion time. Like there’s a guy who obviously left a woman for the priesthood, but left her under questionable circumstances (turns out to be pregnant and stuff, unclear if aborted, more unclear how the miraculous kid became the child of that “tortured” dude). Not also good directing-wise and storytelling-wise, to plant this angst in the form of a Mother Mary statue who later seems to be possessed to represent that abandoned preggy girlfriend; it’s just obvious shock value, from the beginning, from the moment I saw the rebulto inside the room. In scriptwriting terms, we call this plant-and-payoff, pero pangit siyang plant for me kasi obvious masyado. Then there’s another would-be priest taunted by the abandonment he did of his mentally ill mother who was abusive/got abused etc. something something. Tuwing lalabas si mudraks, tumataas din ang audio level ng sigawan-singilan-multuhan mode nilang mag-ina, tapos paulit-ulit lang. Again, shock value. Hay, kakapagod. Tapos isa pa, yung pinaka-scary sa lahat ng technique: using small kids to appear randomly, tapos under your bed pa. This always works. Tengeneh katakut! But after doing it for like the nth time like every other 4th scene, man it gets tiring na. And no, the brilliant cinematography and curious sound design didn’t help a bit; nakakapagod na bigla yung pananakot ng technical elements. It gets old easily. Kasi alam mo na ding bawat labas ng mga respective multo nila will slowly reveal where the haunting came from (the kids nga pala were the would-be priests’ siblings na namatay during wartime kasi hindi niya pinakain at nagdamot siya dahil survival mode so napabayaan chenelyn or something vaguely explained like that). I think the pacing of how each ghostly revelation could be better executed, and subtly siguro, for a deeper-felt scare, not a physically-felt one lang. You know the diff? Takot from within, not takot na ginulat ka lang sa likuran mo at napasigaw ka ng “Ay, kabayo!” sa gulat. Gulat, hindi takot. Magkaiba kasi sila. The film was more of a gulat supplier, not a takot supplier. And that doesn’t work for me. That there’s a seclusion time concept that existed before for would-be priests is something interesting to me, though, and very Catholic, of course, since it parallels the temptation of Christ chuvaness we learn in religion class (former Catholic school girl ini, ‘wag pansinin). I suppose this is the main purpose of that seclusion thing, which gets marred bigla by the presence of this miracle-doing child nga, na medyo over-acting na minsan kasi alam mong ang purpose ng facial expression niya ay manakot na hindi halata (makes me wonder paano siya na-motivate during directing her). Plus I’m still questioning the purpose of why the kid had to be hidden there in that place where the auditioning priests are staying. Malaki ang Pilipinas; wala na bang ibang lugar kung saan puwedeng ilagak si batang anghelita-demonyita beks? Obvious na masyadong storytelling blender itetch: ihalu-halo ang ingredients (characters) sa isang lalagyan (location) and entrap them there to see what (characterization, back story, flaws) comes out. Kapagod panoorin after a while, beks, sa totoo lang. I just wanted to snuggle with my sweetheart sa loob ng sine. We make out when we get bored, is what. Nearly did that, if not for the loud music disturbing us lol. But I digress. Overall, this film feels like one of those horror train rides I used to like back when I was a kid. Naaalala mo pa ba yung Fiesta Carnival dati sa Cubao, na may fixed horror train ride? Yung alam mong may dadaanan ang train na isa-isang section and you ready yourself to be scared in each stage. May ganun din sa Universal Studios sa LA na pinasok naming magkapatid dati, at nampotah hindi siya train kundi lalakad ka lang sa loob. At nakakatakot nga infernez yung bawat stage na dadaanan mo, at ang styles ng pananakot nilang hinanda hahaha nampotah. Merong may haharang sa iyo, hahabol sa iyo, biglang lalabas sa kung saan. Pero masaya siya paglabas mo! House of Horrors nga pala yung tawag dun. That’s me before going in. See the sign that says “walk through terror-filled movie sets” there? Yan, parang ganyan si Seklusyon — horror-filled set, pero hindi thrilling story ang iiwan sa iyo. Ito kasing Seklusyon, ayan nga, parang ganun. You just walk through each horror-designed sequence. You know that each sequence is created to scare the bejeezus outta ya, but only on a surface level. Story needs more beefing up, storytelling din, and yeah, putting it all together to work seamlessly, so the directing has to be more effective. Sorry, here kasi, I can clearly see the seams. Hindi siya flawless beks. Directing-wise, siguro derma pa more next time, for a better ride. Kaya nagataka ako why it won in those categories, lalo na sa scripting-directing tandem. 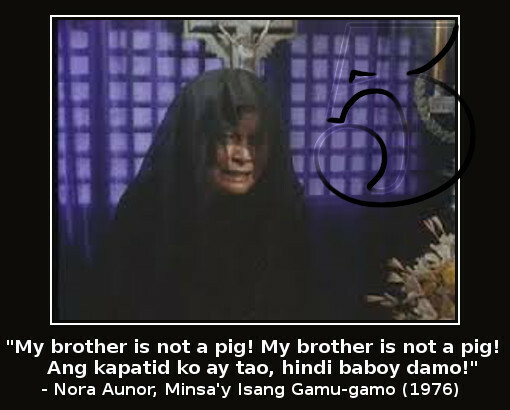 Misteryo ng Buhay No.666. Oh well papel. In the meantime, up to you if you wanna get taken for a ride by this film when it comes out on DVD or shown somewhere else. I miss horror films na konsepto-turned-istorya ang nakakapagpatakot sa iyo, hindi yung pabalot lang. For that’s what Filipino horror films are sometimes, yung pambalot lang ng kendi na gumagawa ng ingay, at nalilimutan nilang lagyan ng flavor ang tunay na bida ng kalakaran — yung kendi mismo. Walang lasa pare. Kulang sa timpla. Wala na yata sa Youtube. Oh well papel. Basta, you know what I mean. O siya, better luck next time na lang.